Mobile County has much to offer. From the Alabama Deep Sea Fishing Rodeo to freshwater fishing, antique shopping to outlet bargains, museums to IMAX Dome Theater, tee-time on the course to tea time at a historic plantation home, world-renowned Bellingrath Gardens to the Battleship USS ALABAMA, Mobile's diversity is evident with an abundance of activities. With a population of over 414,000 and covering 1,220 square miles, there are nine cities, five towns and 16 unincorporated communities in Mobile County. 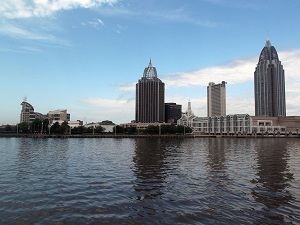 The third largest city in Alabama, Mobile, has almost 200,000 residents. It is known for its streets lined with massive live oaks and is located at the mouth of the Mobile River, leading to the Gulf of Mexico. One of the towns is Dauphin Island, a relaxing beach getaway with world-class fishing, Civil War history and miles of pristine white sand and rolling dunes. Lodging is varied and plentiful. Over 7,500 well-appointed rooms and suites are ready to accommodate any traveler. The Battle House Renaissance Mobile Hotel & Spa was ranked the second best hotel in Alabama by U.S. News and World Report. No matter where one chooses to dine, from a fine restaurant to a down-home cafe, every dish will be served up with Mobile's legendary Southern hospitality. Mobile County has three major universities - one public and two private. There is a Coast Guard military base located in Mobile. Mobile's incredible climate supports year-round outdoor activities. There are more than 70 parks and playgrounds offering facilities for picnicking, canoeing, biking, hiking and camping. Golfing, sailing, skiing, boating and fishing are options 12 months of the year. Mobile has more than 25 golf courses in the area. It is also home to the nation's largest public tennis facility, with 50 hard courts. Mobile offers deep sea fishing in the Gulf of Mexico. The Alabama Deep Sea Fishing Rodeo is one of the largest of its kind in the world. Meaher State Park serves as a gateway to the Mobile-Tensaw Delta. Tours are available to view this unique natural resource, where visitors can learn about birds, fish, bald eagles and black bears. For festivals, it all starts with Mardi Gras. Three weeks of parades, colorful costumes, beautiful floats and marching bands fill downtown Mobile. Mobile County has a lively performing arts scene. Locally-produced opera, symphony, dance and theater give the area a wide variety of performance options. Mobile Symphony offers a full season of classical and pops concerts. The symphony has become known as one of the nation's best orchestras. There are museums and attractions celebrating almost any local topic: history, art, science, horticulture and antebellum architecture. These museums not only make Mobile County a cultural destination, but also provide educational facilities seldom found in an area this size. The Mobile Public Library serves the county with 10 locations and a bookmobile. The Battleship Memorial Park features the USS Alabama, a World War-II era battleship and an aircraft pavilion of historic planes. The Bellingrath Gardens and Home is one of America's most beautiful display gardens and popular attractions on the Gulf Coast. The WAVE Transit System is the public transit system that travels throughout Mobile County. Moda! is the connection to free downtown Mobile city transportation. Vans run every 10 minutes on a 3-mile route. Taxi and shuttle services are available 24-hours-a-day, seven-days-a-week. Public transportation is also available through the Greyhound Bus Service. Mobile has a regional airport. The nearest major airport is in New Orleans. VA transportation is volunteer-driven. Mobile County is a regional center for medical care, research and education. Area highlights include three major hospitals and a medical center that is the region's only Level 1 Trauma Center. There is also the first academic cancer research institute in the upper Gulf Coast region. In addition there are outpatient surgical centers, emergency clinics, home healthcare services, assisted living facilities and nursing homes. There is a VA hospital 60 miles west of Mobile. Jan 40.0 F° 50.5 F° 61.0 F° 5.7 "
Feb 43.0 F° 54.0 F° 65.0 F° 5.3 "
Mar 49.0 F° 60.0 F° 71.0 F° 6.1 "
Apr 55.0 F° 66.5 F° 78.0 F° 4.8 "
May 64.0 F° 74.5 F° 85.0 F° 5.1 "
Jun 70.0 F° 79.5 F° 89.0 F° 6.1 "
Jul 73.0 F° 82.0 F° 91.0 F° 7.3 "
Aug 73.0 F° 82.0 F° 91.0 F° 7.0 "
Sep 68.0 F° 77.5 F° 87.0 F° 5.1 "
Oct 58.0 F° 68.5 F° 79.0 F° 3.7 "
Nov 49.0 F° 60.0 F° 71.0 F° 5.1 "
Dec 42.0 F° 52.5 F° 63.0 F° 5.1 "
Mobile's geographical location on the Gulf of Mexico provides a mild subtropical climate with an abundance of warm, sunny days and mild winters. The warm climate allows citizens of all ages to be active and engage in numerous outdoor activities. Mobile's location on the gulf does bring the occasional tropical storm or hurricane, but there has not been a direct hit on Mobile County since 1979. Condos Over 50 Communities When it comes to housing options, Mobile County has it all in a range of affordable prices - historic neighborhoods, modern subdivisions, waterfront homes, rural solitude, plus rental homes and apartments. The median cost of a home in Mobile County is well below the national average. New subdivisions, with a variety of house plans, are under development throughout the county. There is a selection of existing homes in town and suburban neighborhoods. Home care Senior center Visiting nurses There are vibrant senior centers in the county which provide adult day care, emergency food assistance, home care, transportation and outreach programs. Several communities in the county participate in the Meals on Wheels program. Community Centers offer free transportation to doctors and hospitals, plus free daily meals and fellowship times with other seniors. Home Instead Senior Care is a service to take care of older family members long-term in their own home. Foster Grandparent Program provides services to children and youth with exceptional needs. Seniors serve as a positive role model and mentor children and youth academically and socially. Another program provides assistance and friendship to seniors who are homebound and to frail adults in day care centers. The Retired and Senior Volunteer Program provides essential help at non-profit and health care agencies.